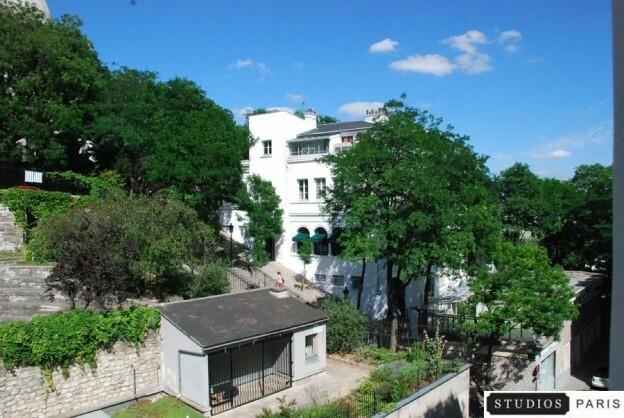 Septième Ciel is a well-equipped, snug, recently-refurbished and pretty North-and-South-facing one-bedroom flat in one of Paris's most outrageously scenic locations, and will you get to enjoy the views! In the morning, while snug and cosy under your blankets, you will wake up to the sight of the Sacré-Coeur's white dome glistening in the sun. Get up and you will enjoy what is possibly the best view on Les Arènes de Montmartre, a Roman-style stone amphitheatre set within a lovely park. Walk to the living room's open kitchen to make yourself some coffee and you'll find yourself face to face with Lady Eiffel herself! When you come home in the evening, she will be glittering in the night sky. Septième Ciel is well-equipped and furnished for two people. It has a washing machine in the kitchen and plenty of storage space in the bedroom. Please note the flat is on the 5th floor. There is no lift.